Explain the main points of hunting laws in your state and give any special laws on the use of guns or ammunition. Give to your counselor a list of sources that you could contact for information on firearms and their use. 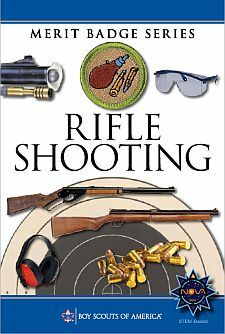 Demonstrate the knowledge, skills, and attitude necessary to safely shoot a rifle from the bench rest position or supported prone position while using the five fundamentals of rifle shooting. Using a .22 caliber rimfire rifle and shooting from a bench rest or supported prone position at 50 feet, fire five groups (three shots per group) that can be covered by a quarter. Using these targets, explain how to adjust sights to zero a rifle. *Note: It is not always practical to adjust the sights (i.e. when using a borrowed fixed-sight rifle). For requirement 2l, you may demonstrate your ability to use the shooting fundamentals by shooting five shot groups (five shots per group) in which all shots can be covered by or touch a quarter and then explain how to adjust the sights to zero the rifle used. Demonstrate the knowledge, skills and attitude necessary to safely shoot a target from the bench rest position or supported prone position while using the five fundamentals of rifle shooting. Discuss a brief history of the development of muzzle-loading rifles. Identify principal parts of percussion rifles and discuss how they function. Demonstrate and discuss the safe handling rules of muzzle-loading rifles. Identify proper procedures and accessories used for loading a muzzle-loading rifle. Demonstrate the knowledge, skills, and attitude necessary to safely shoot a muzzle-loading rifle on a range, including range procedures. Explain what a misfire, hangfire, and squib fire are, and explain the procedures to follow in response to each. Shoot a target with a muzzle-loading rifle using the five fundamentals of firing the shot. Identify the materials needed to clean a muzzle- loading rifle safely. Using these materials, demonstrate how to clean a muzzle-loading rifle safely. Identify the causes of a muzzle-loading rifle's failing to fire and explain or demonstrate proper correction procedures. Discuss what points you would consider in selecting a muzzle-loading rifle. Using a muzzle-loading rifle of .45 or .50 caliber and shooting from a bench rest or supported prone position, fire three groups (three shots per group) that can be covered by the base of a standard-size soft soft drink can. at 50 yards using NRA A-25 or NMLRA 100 yard targets - 7.